The inclement weather of the past two weeks has adversely affected our plants and production, reducing the amount of produce we will be offering at today’s market. Arrive early! 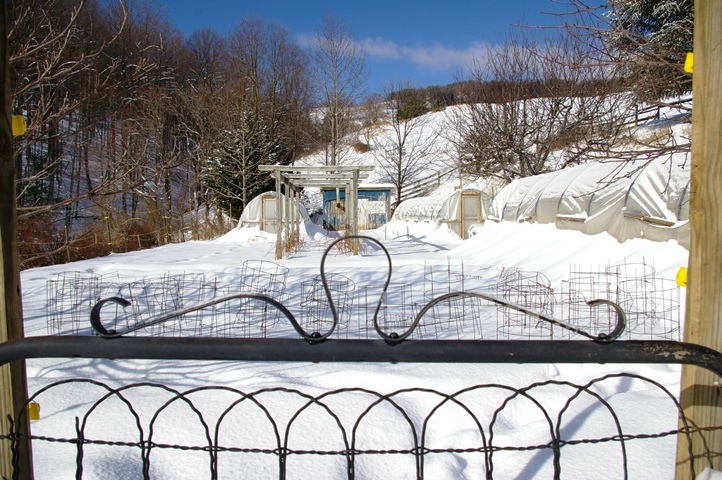 Last year, February the 19th, our high and low tunnels succumbed to the weight of accumulating snow; they collapsed in on themselves. Luckily they fell in such a way that our plants were not damaged. 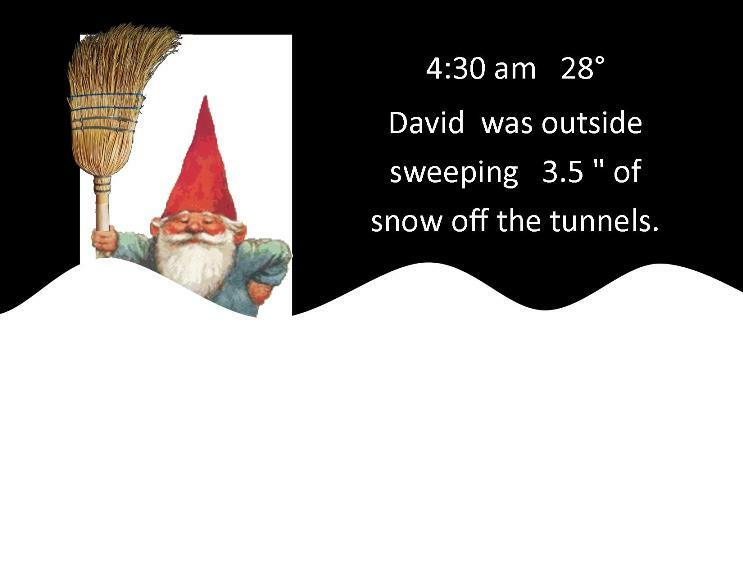 This year David has been very diligent about keeping the tunnels snow free, however, it has been the single digit and subzero temperatures that have been the bane of this winter’s growing season. Because of Monday’s and Tuesday’s weather forecast we decided to harvest on Sunday. We enjoyed a heat wave of 50°. It was the first day I had a good look at the condition of our plants since we were inundated with snow and artic temperatures. As usual spinach is the champion of survivors with mizuna, kale and mustard being close seconds. All of our smaller plants that I set out a few weeks before the Arctic Blast were damaged and the black kale, which has been established for months, is not faring well. Once again we will adopt a wait and see attitude before removing anything. We are very optimistic about next week’s forecast. David is planning on setting out the pea seedlings in the tunnels this weekend and I am starting to germinate my tomato seeds today; it will take them about a week to emerge. 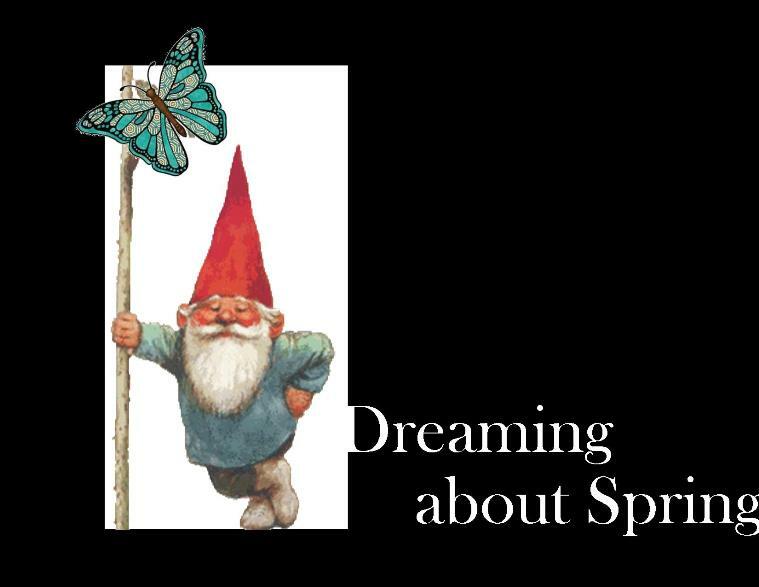 Posted by The Professor's Garden in Farm Journal. Comments Off on Big Surprise! Posted by The Professor's Garden in Farm Journal. Comments Off on Heat Wave! 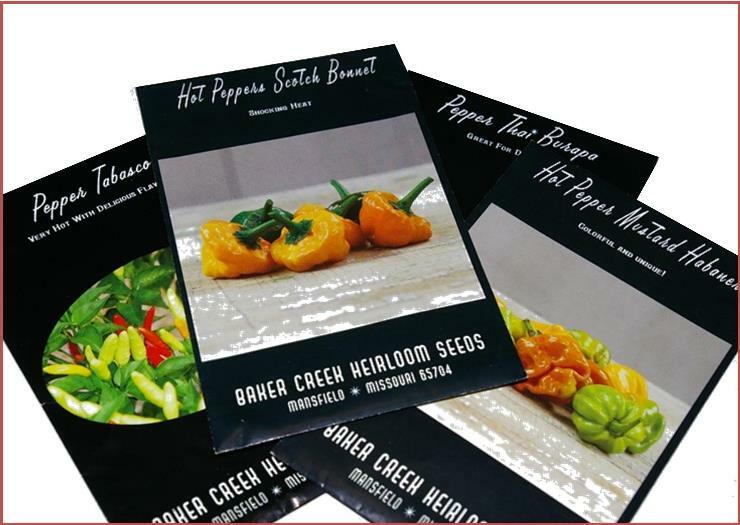 I have the potential to produce 29 varieties of Hot Peppers this coming season. Posted by The Professor's Garden in Farm Journal. Comments Off on What is the Difference? The basic difference between these growing houses, for winter production, is heat. 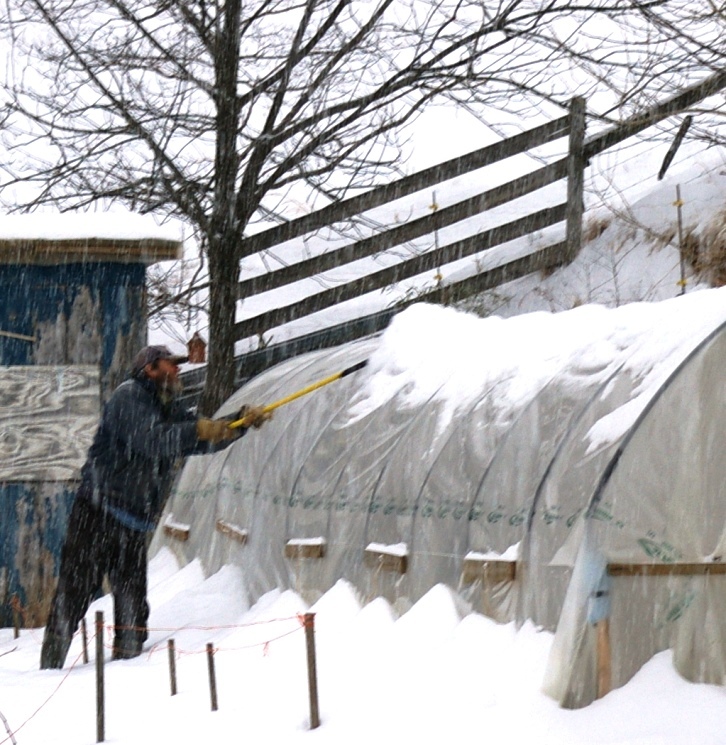 High tunnels are unheated and growers use nature and covers to control the environment in their tunnels, while greenhouse growers use some type of fuel, such as wood, oil or natural gas, to produce heat. Our greenhouse is a lean-to that is next to our basement. 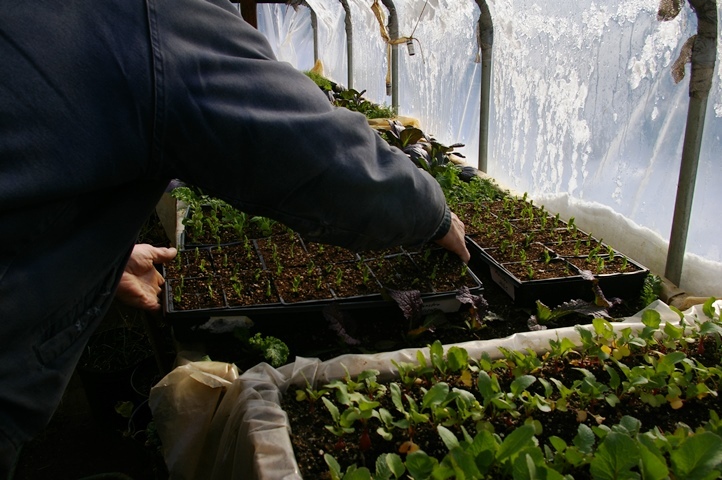 Fans blow the warm air, produce by our oil furnace, from the basement into the greenhouse. 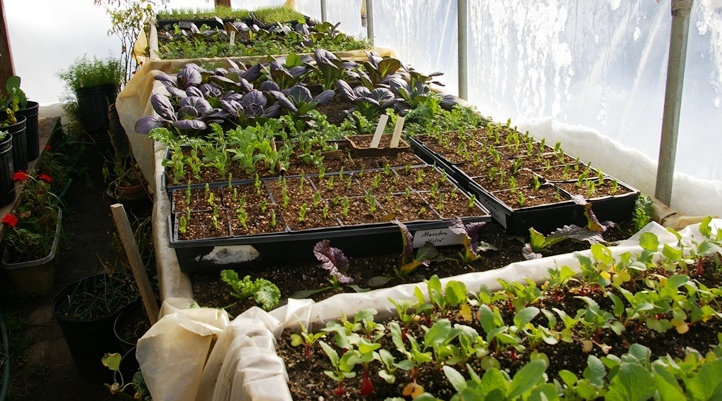 However, for extra protection, on very cold nights, we move our growing trays and pots into the basement. After spending a cold night in the warmer basement our seedlings are moved into the sunlight. The pea seedlings are ready to be planted in the tunnels but for now they have to wait for warmer weather. We grow cold tolerant plants , like kale and Mizuna, in our Winter Tunnels. We double cover them, on extremely cold nights, and hope for the best.